Kate Mosse – author, broadcaster, theatre director and co-founder of the Orange Prize for fiction – was named the 2000 European Woman of Achievement for her contribution to the arts. She has long worked to make reading accessible – raising money for Dyslexia Action – and has recently become one of the most vocal authors campaigning against the closures of the UK library service. So you see – a natural hero for this member of LeedsBookClub!! 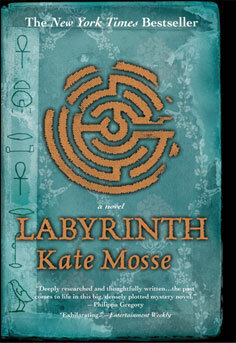 As the first book had been released several years prior to my reading it; I didn’t feel quite so assaulted by it’s marketing as I had the Kate Morton books; though Labyrinth was one of those books that seemed to be beckoning seductively to me in book shops – particularly in airports – for yonks. Especially when I was only carrying hand luggage and was most definitely unable to pick it up! Tease!!! In the Pyrenees mountains near Carcassonne, Alice, a volunteer at an archaeological dig, stumbles into a cave and makes a startling discovery – two crumbling skeletons, strange writings on the walls, and the pattern of a labyrinth. Eight hundred years earlier, on the eve of a brutal crusade that will rip apart southern France, a young woman named Alais is given a ring and a mysterious book for safekeeping by her father. The book, he says, contains the secret of the true Grail and the ring, inscribed with a labyrinth will identify a guardian of the Grail. Now, as crusading armies gather outside the city walls of Carcassonne, it will take a tremendous sacrifice to keep the secret of the labyrinth safe. I really wanted to passionately love this book. I like dual narrative stories. I love Grail stories (thank you Monty Python) and I really really like fiction that results in my looking up history to learn a bit more about the time period and geographical location. Clearly I was onto a winner…yes? For the most part; I actually was. Labyrinth has an engaging(if not entirely original) plot; the situation, geography and history are well handled – you can tell that the author absolutely loves the region in question. It just isn’t quite the book that it might have been. There was a perfectly sound mystery element that seemed to take second place to a far less tangible ’emotional’ connection between the two primary characters. I felt that there were too many correlations drawn between Alais and Alice – I would have preferred those to be left unstated; to have drawn the lines myself, rather than had them pointed out (in some cases with neon lights!). This fed into the secondary characters. Once I had some idea where the story of Alais was heading; I started trying to place the contemporary characters into context – too distracting by half! Having said that; my interest was maintained throughout; the momentum only falters once or twice and is quickly recovered again. It’s a grail story, but one where unusually; the primary active protagonists are female! Huzzah!! They are unafraid, independent and determined. I say Huzzah once more!! I’m delighted to hear that Ridley Scott is adapting this story for television, making a four hour mini-series to be released in 2012. He is a director with a proven track record when it comes to strong female characters, so it should be very exciting stuff! In 1891, young Leonie Vernier and her brother Anatole arrive in the beautiful town of Rennes-les-Bains, in southwest France. They’ve come at the invitation of their widowed aunt, whose mountain estate Doami de la Cade, is famous in the region. But it soon becomes clear that their aunt Isolde – and the Domain – are not what Isolde had imagined. The villagers claim that Isolde’s late husband died after summoning a demons from the old Visigoth sepulchre high on the mountainside. A book from the Domain’s cavernous library describes the strange tarot pack that mysteriously disappeared following the uncle’s death. But while Leonie delves deeper into the ancient mysteries of the Domain, a different evil stalks her family – one which may explain why Leonie and Anatole were invited to the sinister Domain in the first place. More than a century later, Meredith Martin, an American graduate student , arrives in France to study the life of Charles Debussy, the nineteenth century French composer. In Rennes-les-Bains, Meredith checks into a grand old hotel – the Domain de la Cade. Something about the hotel feels eerily familiar, and strange dreams and visions begin to haunt Meredith’s waking hours. A chance encounter leaders to a pack of tarot cards painted by Leonie Vernieer, which may hold the key to this twenty-first century Americans fate…just as they did to the fate of Leonie Vernier more than a century earlier. This is a particularly uneven book; hampered by a rather ludricris plot. At times; I loathed aspects of it so much I could hardly bear to continue; other times I couldn’t put it down it was so gripping. Given the prestige attached to the author; frankly I had expected the writing to be…more. Better-er (to invent a word). At times the plot lacked coherency; the characters behaved erratically and contrary to their own interfnal logic; most criminally – the writing was often clinical and cold – especially at points when it should have been tinged with emotions. The dual narrative device wasn’t used half as well as in the preceeding book – I’m still not entirely sure what the point of the contemporary character was; except to ensure parity with Labyrinth. I think if forced to review in one word – I’d have to say frustrating. This is a ‘potential’ book – as in, it has the potential to be a great book, it just never quite achieved that status. I will be reading the third in the series – I can’t abandon a series just because one book is a bit of a let down, but my enthusiasm has certainly wained after this offering. The Great War took much more than lives. It robbed a generation of friends, lovers and futures. In Freddie Watson’s case, it took his beloved brother and, at times, his peace of mind. In the winter of 1928, still seeking resolution, Freddie is travelling through the French Pyrenees. During a snow storm, his car spins off the mountain road. He stumbles through woods, emerging in a tiny village. There he meets Fabrissa, a beautiful woman also mourning a lost generation. Over the course of one night, Fabrissa and Freddie share their stories. By the time dawn breaks, he will have stumbled across a tragic mystery that goes back through the centuries. Originally conceived as a novella for the Quick Reads Initiative; I picked up this charming Gothic near fairytale over Christmas of last year. 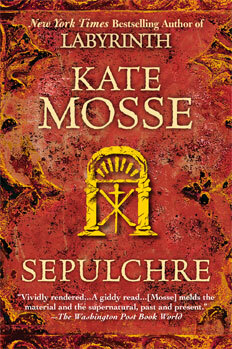 A pure and deceptively simple ghost story; I enjoyed this far more than Sepulchre. Medieval strands of history are merged with post-war 21st century to great effect. Freddie is a tragic character – his whole life has been tinged with blue – but his emotional and mental fragility never feels forced or trite. Rather, Ms Mosse deftly paints a man nearing the end of his tether. Perhaps it’s the brevity of the story, but watching his trudge through Europe; his past desperate search for meaning in a world that is both hard and unthinkingly cruel; feels a far more intimate affair than the author achieved in either of the novels described above. 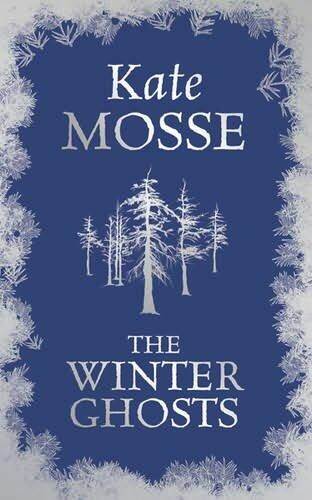 I really hope that Ms Mosse continues to explore this format of story telling. While novellas do not allow for such dramatic flair as her previous books did; I think that the restrictions suit her style better. Agree, i loved the descriptions of the landscape and the history in labyrinth, but there were lots of things i didn't like, mainly all the points you make! And Sephulcre was soooo silly! but they are definitely good holiday reads.